The number of ways one can consume cannabis continues to rise as cannabis flower sales as a percentage of all cannabis sales continues its decline. While healthy consumption methods include patches, sprays, tinctures, inhalers and edibles, one can also create a healthy, delicious, non-alcoholic beverage that contains the benefits of this ancient superfood. If you don’t yet have legal access to cannabis infused products, you can create many at home. One of these is a canna-cranberry and rosemary infused holiday mocktail with a base of a rosemary-infused cannabis simple syrup and a garnish of canna-cranberries. Once on hand, the psychoactive sweetener can be used to spruce up a variety of concoctions and confections. The canna-cranberry garnish is intended to add to aromatics and will not cause any psychoactive impact. Is authority the truth or truth the authority? The final yield should be close to 24 oz, which is enough to make 12 moderately-dosed cannabis beverages (2 oz each) containing approximately 10-15 milligrams of THC per serving (depending on the potency of the cannabis used). This tasty cannabis infused drink can add a festive punch of color to any gathering and is ideal for escaping or enhancing an evening. 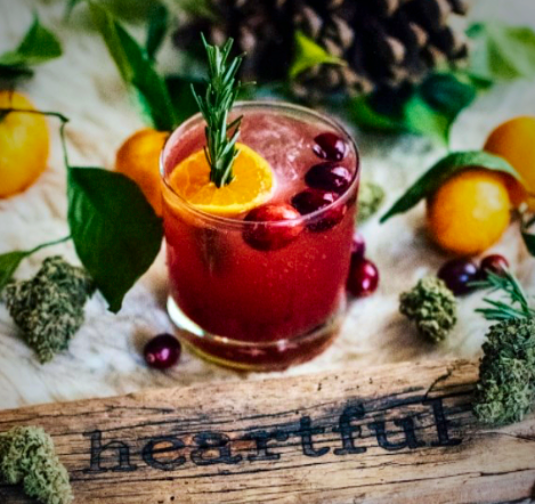 Mix and match flavor profiles by swapping out the rosemary for mint, thyme or fresh pine needles to create your own version of the canna-cranberry and rosemary mocktail. If you happen to overindulge, these tips may help guide your journey. Thank you, John Korkidis at Chron Vivant, for your contributions. Life is as short as memory, as rich as imagination, as vibrant as feeling and as profound as thought.